Description: CSA #13 bisect on cover postmarked CHARLESTON, S.C., JUL 21, 1863 sent to Anderson Court House, SC. 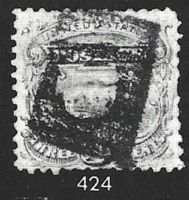 Description: CSA #13 bisect on cover postmarked CHARLESTON, S.C., SEP 16 sent to Camden, SC. Description: CSA #4 pair on cover fashioned from plain egg shell creme color wallpaper postmarked JACKSON, MISS, JAN 12 sent to Brownsville, Mississippi. 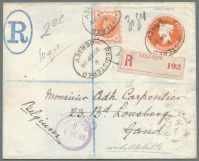 Description: CSA #4 on cover postmarked YORKVILLE, S.C., APR 16 sent to Charleston, SC. Description: CSA #2 STONE Y on cover postmarked CHARLESTON, S.C., NOV 13, 1862 sent to Newberry, SC. Description: CSA #2 on cover postmarked CHARLESTON, S.C., DEC 29, 1862 sent to Lt. R(ichard) Y(eadon) Dwight, Abbeville Court House, SC. 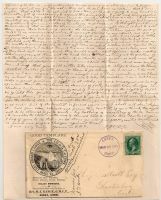 Description: CSA #2 on adversity cover fashioned from a business document postmarked MOBILE, ALA, FEB 18 sent to Thorn Hill, Alabama via Tuscaloosa. Description: CSA #1 on cover postmarked CHARLESTON, S.C., APR 14, 1862 sent to Chester Court House, SC. Description: CSA #1 on cover postmarked GRIFFIN, GA, APR 1 sent to Colonel W A Wilson, Madison, Ga. Description: CSA #1 on cover postmarked MARIETTA, GEO., MAR 31 sent to Dr. Thomas W(ingfield) Grimes, Columbus, Geo. Description: CSA #1 on cover postmarked CHARLESTON, S.C., MAR 26, 1862 sent to Lauren's Court House, SC. Description: CSA #1 on cover postmarked CHARLESTON, S.C., FEB 3, 1862 sent to Longmire's Store, SC. Description: CSA #11 JUMBO on butch paper fashioned envelope manuscript postmarked COTTAGE MILL, MAR 14 sent to Macon, GA. Description: US #65 on cover postmarked PORT ROYAL (SC), JUN 23 (upside down date), with unlisted fancy stylized leaf cancel sent to Providence, RI. Description: US #65 on very early stamp collar cover postmarked PAWTUCKET, R.I., DEC 6, 1864 with matching bulls eye 4 ring target cancel sent to Warrick RI. Description: WWII Patriotic cover postmarked FREEMONT, OHIO, AUG 22, 1945 and sent to Columbus 7, Ohio. Description: CSA #11 on handstamped forwarded cover postmarked CHARLESTON SC, JUL 10, 1863 sent to Richmond, VA then forwarded to Crawfordville, Geo. Description: CSA #7 pair on Wesleyan Female College cover postmarked PETERSBURG, VA sent to Lynchburg, VA.